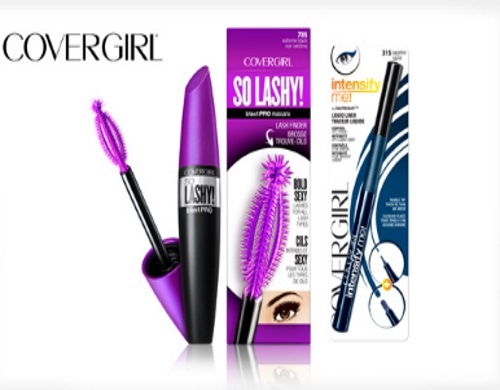 Another Bzzagent CoverGirl campaign for Canadian Bzzers! This is for the new CoverGirl So Lashy! mascara and Intensify Me Eyeliner! So Lashy! mascara adapts to give you bold, dark volume from every angle. Available in eight colors, the 3-in-1 brush separates, defines and lifts lashes, even corners and hard to reach lashes. Once your lashes are looking luscious, add another eye-catching element with Intensify Me! eyeliner in Intense Black, Sapphire, Emerald, Blue Topaz or Smoked Amber. The precision paddle tip goes from thick to thin for a 2-in-1 look with the control of a pencil and intensity of a liquid liner. Were you invited to this campaign? Let us know on our Facebook Page.! I was chosen for the other CoverGirl campaign that I blogged earlier, but not this one.